A host of factors play an important role in deciding where to move, including the quality of schools, the strength of the local economy and job market, safety, culture, and even climate. More than three-quarters of adults in Newton have at least a bachelor’s degree, high even compared with Massachusetts as a whole — the state’s over 40% college attainment rate is the highest of any state. 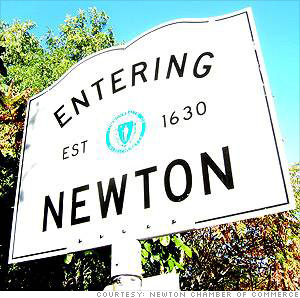 A college degree is one of the surest paths to a high income, and Newton residents are some of the nation’s wealthiest. Even after adjusting for the city’s relatively high cost of living, the typical household earns $114,201 annually — eighth highest nationwide. As is common in cities with high-income populations, Newton’s violent crime rate of 83 incidents per 100,000 residents is one of the lowest in the country. It is a fraction of the national violent crime rate of 373 incidents per 100,000 people.